My little girl turns 1 today! It really does go so fast. To honor that I’m finally writing up our birth story. Luckily I tracked down what I posted in my online mom group as some of the details are already getting hazy. I was so excited when we got pregnant with our little girl. I read lots of books about giving birth and my husband and I took classes to try to prepare for a more natural birth. My husband even tried to convince me we should have a home birth…not my cup of tea. I don’t want to be responsible for the cleanup. I had a visual birth plan all drawn up and ready to go for when we eventually went to the hospital. We also had a doula lined up, a must have if you can afford to do it. Then my water broke and all of that went out that window! My husband and I were in bed watching The Big Lubowski. We had spent a good portion of the day at the International Car Show chasing after my two nephews. Then we came home and I suggested we go out to dinner as it could be our last night without a baby, I was almost a week overdue and desperate for this kid to get out of me already! He swore it wasn’t going to be our last night, but begrudgingly agreed to go when I told him he could watch football and didn’t have to talk to me lol. We went to Outback Steakhouse and had a lovely steak and he got to watch his football game. We were night owls, still are a lot of the times. So instead of sleeping there we were watching movies in bed well after midnight. I went to use the restroom before bed, since pregnant ladies have to pee constantly, and noticed some light pink discharge. So I stuck a pad in and decided I should stay up for a while longer and monitor it. Around 1:30am I felt a pop followed by a gush. I jumped out of bed and waddled into the bathroom. I was leaking a lot of yellow/green liquid (this was meconium). I called my husband and told him I was pretty sure my water had broken. I’ve never seen that man get dressed so quickly. I was immediately concerned about the color. He texted our doula who agreed we should call the hospital. They said they wanted us to come in right away to get checked out due to the color. So we bundled into the car thinking we were just going to have things checked and would then come home and labor at home for a while per our plan. By this time we were exhausted. It was early in the morning of January 2nd and we hadn’t slept since waking up on the 1st. I tried to doze a little and was in a half asleep daze when alarms went off and they came running into the room because our babies heart rate had dropped. They gave me electrolytes and oxygen which got her back to normal. But now there was no chance of getting off the IV and I had to have continuous instead of intermittent monitoring of our baby girl…more of our birth plan out the window. A doctor came in and was concerned that I still wasn’t really feeling the contractions and they weren’t being very effective. (When you have meconium in your water you are on a bit of a timeline as there is a worry and risk of infection). I managed to push off starting pitocin for a while in hopes that my body would get things going. I walked around, sat on a birthing ball, etc but to no avail. Around 8am after discussing it with my husband and doula I agreed to start the pitocin. Once I had the pitocin my contractions started getting more and more intense. I tried fentanol first but that stuff did not do a darn thing! Finally I admitted to my husband that I couldn’t do this anymore and we had to talk epidural. I had hoped to avoid one as I hate needles and I know they can have side effects for both mom and baby but I was so tired and in too much pain. My doula told me she’d only seen one woman get pitocin and still avoid an epidural so I felt a little better. Finally things started progressing. I could feel her starting to come and then they said, stop, we have to wait for the doctor. If I’d been more lucid I may have smacked them right then. I certainly would have ignored them and kept pushing and she would have been born 10-15 minutes earlier and a bit more easily for me. Once I had paused I was so worn out it was hard to get things going again. Once the doctor arrived we resumed pushing but I was so exhausted. The doctor said she could do an episiotomy and the baby would come right now. I agreed as I was desperate to be done. I ended up with a second degree tear and an episiotomy. But, it worked, at 10:48pm my daughter was finally born and they laid a warm wriggly mass on my chest. My daughter was here and I was officially a mom, although in that moment I felt more like a scared little girl. I wish I could say things went smoothly from there. But I was bleeding a lot. They stitched me up and put all sorts of drugs and pads down there to stop the bleeding. Thankfully my daughter had not gotten an infection from the meconium but I had, which meant antibiotics for me. I was running a fever and was too warm so my husband took over doing skin to skin, something we had thankfully prepared for. They wanted to monitor her for an infection so an hour or so after she was born her and my husband went down to an observation area, not quite the NICU but with more constant monitoring of the baby. Meanwhile I was taken away to a recovery room where I finally got some sleep. I woke up dazed and alone. Wondering where my husband and child were. Finally she was cleared and we were reunited and we got to start getting to know this amazing little girl. Planning is great, definitely have a plan. But, also have a back up plan for when things inevitably go awry. While my birth didn’t go as plan I know I did the best I could for my little girl and fought for as long as I could before agreeing to give up things I wanted. Perhaps next time things will go more smoothly. Hopefully I’ll get to find out. 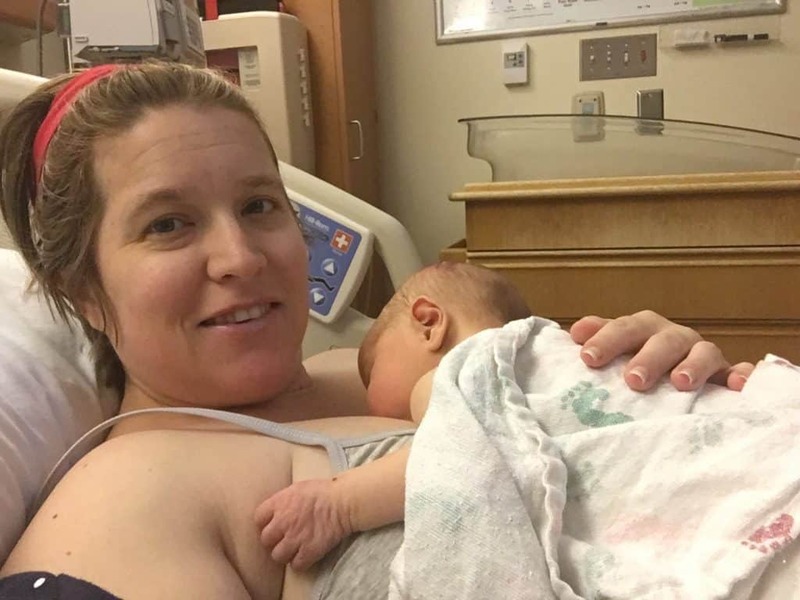 I’ve also shared our breastfeeding struggles and journey in hopes on educating and inspiring other moms to seek out education and help if they need it. Thank you for reading my birth story. It’s so important to share our stories with each other. Every story is unique and special :).